Caput Nili, How I Won the War and Lost My Taste for Oranges. Lisa Gill. With art by Kris Mills. West End Press with Burning Books. Albuquerque, New Mexico. 2011. This isn't the African Queen but it is one hell of a journey. Lisa Gill navigates a terrible history with a splendid poetic voice. Her misery and the violence she endures become a road map for the fascinated reader, an illuminated text from the inside of a journey that until now - we could only imagine. than the usual rock through my window. I thought of the tooth fairy. try to give back better than I get. Almost thought I heard the melodious voice of Deadwood's Al Swearingin - and that sort of resourceful and be damned voice would not be out of place in Lisa Gill's Caput Nili world. Gill ties together the myriad moments of her mental trek with prose introductions that help shape the narrative, always looping back to her central themes of struggle/violence/resolution. This book is not like the rest. Although these poems work on their own — when tied to Gill's prose narrative we really are participants in a talented writer's struggle to drop the shotgun, pick up the pen. months before I went to the ER with numb legs. into my entryway, scoping me and the place out. if he came back, he'd figure out I have a shotgun. I love the comic menace that is on the tip of Gill's tongue. Highly entertaining and wickedly intelligent. Lisa Gill confounds expectations and opens new doors. She puts her knee where you don't want it and pushes. Poetry is what poets make of it and Gill curls her lip and surfs her own dark wave, navigates the surly water if only to amuse herself, get to the truth of it. There are groceries and dishes. Books that make me forget to water the houseplants. to get a pitcher of water and pour it. I eat apricots and let my lover hold me. I let my cat, and only my cat, walk all over me. Violence is the least of my life. it's not the half of it. What is it we all long for? A quiet moment of genuine peace. Gill's brave adventure sure has some hellish moments, she is clearly a very tough woman, but as horrid as some of the steps of her journey appear — how did reading her book make me so happy? Lisa Gill is the recipient of a National Endowment for the Arts Fellowship in Literature, an Achievement Award from UNM, the Red Shoes Award (named after Dara McLaughlin), and a New Mexico Literary Arts Gratitude Award. She is the author of The Relenting: A Play of Sorts and the poetry collections Red as a Lotus, Mortar & Pestle, and Dark Enough. 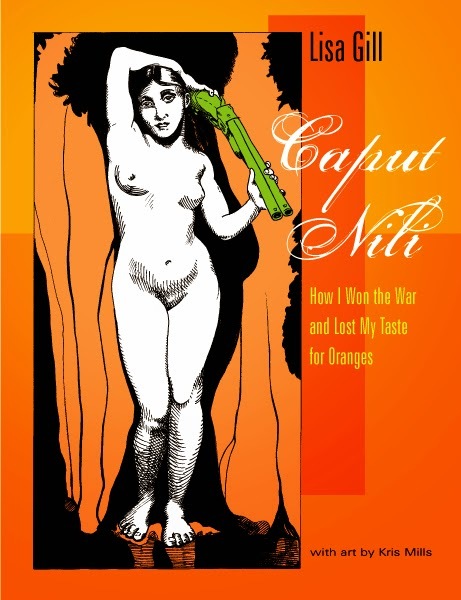 A graphic memoir titled Caput Nili: How I Won the War & Lost My Taste for Oranges has also been released by West End Press and Burning Books, and includes five essays, 89 poems, MRI brainscans, and art by Kris Mills. Recent publications include Tuesday; An Art Project, 1913: A Journal of Forms, The Bigger Boat and a poem in the National Endowment for the Arts’ Annual Report. She served as artistic director of STIR: A Festival of Words and received her MFA with distinction in creative nonfiction from the University of New Mexico. She has performed widely from the Taos Poetry Circus to the Thom McGrath Visiting Writers Series in Minnesota and the Seattle Poetry Festival. She favors collaborations and has worked with visual artists Kris Mills, Becky Holtzman, Suzanne Sbarge, Valerie Roybal, Heidi Pollard plus video guru Bryan Konefsky, filmmaker Jeanne Liotta, and Dome Artist Hue Walker. She has performed with countless musicians including Mike Balistreri, Mark Weaver, Janet Feder, J.A. Deane, C.K. Barlow, Mitch Rayes, Kurt Heyl, The Michael Vlatkovich Trio and th3 e1emental orke5tra. She now makes her home in Albuquerque, New Mexico, where she helps coordinate poetry for both 516 ARTSand Church of Beethoven and serves as Artistic Director for Local Poets Guild.